I would seriously eat eggs for breakfast, lunch and dinner - only if I could. Thats how much I love devouring them in any way its cooked. 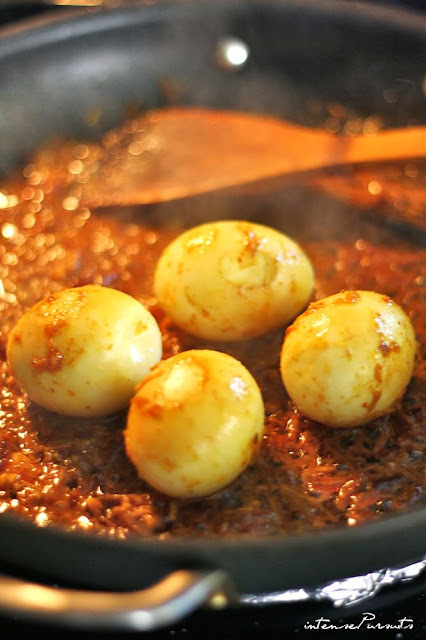 Egg curries are very common and quite simple in the Asian subcontinent. Sometimes it is a quick lifesaver when there is nothing in the fridge, while other times it can be a rich creamy delicacy. This particular recipe falls in the middle. If the yogurt/milk is taken aways then this becomes an everyday egg curry - don't be fooled by the word everyday, it will still be quite tasty. To make this a richer recipe all you have to do is take out the turmeric and add butter/ghee and some more cream. I hope I made sense! Boil the eggs and peel them and then set them aside. Heat oil in a flat pan. Add the onions and sauté until golden. Add the minced ginger/garlic. Immediately add all the dry spices. Garam masala powder is basically a mixture of these spices - black and white peppercorns + cloves + cinnamon + black and white cumin seeds + black, brown and green cardamom pods. In some recipes, the whole spices are used instead of the powder, and sometimes both. Once the spices are in the oil you have to immediately pour 1/3 cup of water into the pan - otherwise the spices will lose their color. Let the water cook the spices and evaporate. Once the oil rises, stir in the eggs and let them catch some color. Add the salt. Blend the yogurt and the milk together. Then add this mixture to the eggs. Add 1/2 a cup of hot water and the pinch of sugar. The sugar will balance the sourness of the yogurt. Cover and cook until the curry thickens. Adjust the seasoning. Sprinkle with green chilis. Bon appétit!